Originally published under the title, "Opening the 'Gates of Evil'." 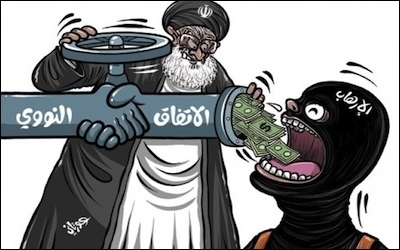 A cartoon in the Saudi daily Al-Watan shows Iran increasing its funding of "terrorism" after the nuclear agreement. The response in the Arabic-speaking world to the conclusion of a deal between the P5+1 countries and the Islamic Republic of Iran over the latter's nuclear program has divided along familiar lines. Among pro-Iranian elements, such as President Bashar Assad of Syria and Hezbollah leader Hassan Nasrallah, the news of the deal has, predictably, been met with jubilation. Assad described the agreement as a "historic achievement" and a "great victory." Sunni Arab concerns have focused less on the terms of the deal than on its strategic implications. Among Sunni elements opposed to the advance of Iran, concerns have focused less on the nuclear elements of the deal – that is, whether it will effectively halt Iran's march toward the bomb. Instead, attention has centered on the deal's implications for Iran's push for hegemony in the Middle East, and its interference in and subversion of regional states as part of this effort. Western governments will be under great pressure to make the deal succeed and therefore turn a blind eye to many of Iran's destabilizing policies as well as Tehran's blatant interference in the domestic affairs of its neighbors. Moreover, the West will also have to neglect Tehran's support of extremist militias, such as Iraq's Popular Mobilization forces, also known as the Hashd al-Shaabi, that have gradually become almost part of Iraq's military. Iran has established a policy based on the equation of fighting terrorism with terrorism amid deafening silence from the West. Saudi Arabia and the Gulf states can only welcome the nuclear deal, which in itself is supposed to close the gates of evil that Iran had opened in the region. However, the real concern is that the deal will open other gates of evil, gates which Iran mastered knocking at for years even while Western sanctions were still in place. From this perspective a particularly notable and dismaying aspect of the deal is its removal of the Iranian Revolutionary Guards Corps and its Quds Force commander, Maj.-Gen. Qasem Soleimani, from the list of those subject to sanctions by the West. The ending of sanctions will enable Iran to massively increase aid to its long list of regional clients and proxies. The ending of sanctions on the IRGC, and more broadly the likely imminent freeing of up to $150 billion in frozen revenue, will enable Iran to massively increase its aid to its long list of regional clients and proxies. Iran today is heavily engaged in at least five conflict arenas in the region. The Iranian creation and proxy Hezbollah in Lebanon is the dominant political and military force in that country. The organization depends on Iranian support, training and funding to maintain this position. In Syria, beleaguered dictator and Iranian client Assad remains in control in the west and south largely because of Iranian support and assistance – up to $1 billion per month, according to some estimates. For as long as Assad remains, the war remains, allowing such monstrous entities as Islamic State and al-Qaida to flourish. Iran's Revolutionary Guards are unmatched in clandestine and proxy warfare, having effectively created an alternative armed force for Assad when his own army became unreliable in 2012. This force, the National Defense Forces, has plugged the gap in manpower which is the regime's greatest vulnerability. But in addition, Iran has channeled others of its proxies, including Hezbollah, Iraqi Shi'ite militias, and lately increasing numbers of Afghan Hazara Shi'ite "volunteers," toward the Syrian battlefield. In Iraq, the Iranian-supported Shi'ite militias of the Hashd al-Shaabi are playing the key role in defending Baghdad from the advance of Islamic State. 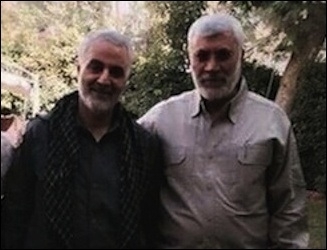 These militias are trained and financed by the Revolutionary Guards and organized by Soleimani and his Iraqi right-hand man, Abu Mahdi al-Muhandis, also thought to be an IRGC member. In Yemen, the Iranians are offering arms and support to the Ansar Allah, or Houthi rebels, who are engaged in a bloody insurgency against the government of President Abd Rabbo Mansour Hadi. Among the Palestinians, Tehran operates Palestinian Islamic Jihad as a client/proxy organization, and is in the process of rebuilding relations with the Izzadin Kassam, the powerful military wing of Hamas. All this costs money. In a pattern familiar to the experience of totalitarian regimes under sanctions in the past, Iran has preferred to safeguard monies for use in service of its regional ambitions, while allowing its population – other than those connected to the regime – to suffer the consequent shortages. Still, in recent months, things weren't going so well. Assad has been losing ground to the Sunni rebels. Hezbollah has been hemorrhaging men in Syria. The Shi'ite militias were holding Islamic State in Iraq but not advancing. Saudi intervention was holding back further advances by the Houthis in Yemen. Hamas was looking poverty-stricken and beleaguered in its Gaza redoubt. The sanctions, plus these many commitments, were bringing the Iranian regime close to an economic crisis that would have confronted the regime with the hard choice of lessening its regional interference or facing the consequences. No longer. The deal over the nuclear program is set to enable Tehran to shore up its investments, providing more money and guns to all its friends across the Middle East, who will as a result grow stronger, bolder and more ambitious. This, from the point of view of the main powers in the Sunni Arab world, is the key fallout (so to speak) from the deal concluded in Vienna. IRGC "outreach" to Shi'ite minorities in Saudi Arabia and Kuwait, and to the Shi'ite majority in Bahrain, is also likely to increase as a result of the windfall. Sunni Arab states and Israel will develop strategies independent of the US to stem the Iranian advance and turn it back. It has been felt in recent years in Riyadh, Cairo, Amman and other Sunni Arab capitals that the United States is determined to withdraw from active involvement in the region, and in pursuit of this goal is currently pursuing a dangerous path of appeasement of Iran. This impression is compounded not only by the stance toward the Iranian nuclear program but also by the US response to Iran's activities across the Middle East. In Iraq, the US appears to be acting in tandem with Iranian goals, with no apparent awareness of the problems in this regard. Similarly, in Lebanon the West is supporting and equipping the Lebanese Armed Forces, without understanding that the Lebanese state is largely a shell, within which Hezbollah is the living and directing force. In Syria, the US is pursuing a half-hearted campaign against Islamic State, while leaving the rest of the country to its internal dynamics. The nuclear deal compounds and completes the picture. From the perspective of the Saudis and other Sunni Arabs, Iranian ruthlessness, clarity and advance combined with the flailing, retreating US regional policy now so much in evidence spell potential disaster. The Sunni Arabs, along with Israel and other regional opponents of Iran, will now develop strategies independent of the US to stem this advance and turn it back. The outcome of that struggle will determine the fate of the Middle East. Jonathan Spyer, a fellow at the Middle East Forum, is director of the Rubin Center for Research in International Affairs and the author of The Transforming Fire: The Rise of the Israel-Islamist Conflict (Continuum, 2011).